Established in the year 2011, we, "Balram Organic Bio Fertilizer", are among the leading and topmost manufacturers of optimum quality Agricultural Fertilizers. The product range offered by us is inclusive of Cotton Crop, Soil Conditioner and Oil Seed Fertilizer. These fertilizers are processed with high-quality ingredients that are sourced from trusted and reliable vendors. By using advanced tools, our professionals process the offered fertilizers in compliance with the industry set norms and regulation. Available with us at industry leading prices, these fertilizers are known for their rich attributes such as compositional accuracy and longer shelf life. In addition to this, the offered range is available with us at affordable prices. Supported by our efficient workforce and an ultra-modern manufacturing unit, we have been able to cater to the precise needs of our valuable customers. Post production, we assure that the premium quality of the offered fertilizers is never compromised. We offer this range with tamper-proof packaging, to avoid any damage while transportation. Keeping the ease of our valuable customers, we accept different modes of payment. We were established as a partnership firm and are currently operating under the supervision of our chairman, "Mr. Nayansinh T. Padhiar", He with his experience and knowledge of this domain has helped us in catering to the precise needs of our valuable customers in the most efficient manner. Job Work, Manufacturing and Trading of Agricultural Fertilizer. Supported by a team of skilled professionals, we have been able to cater to the precise needs of our valuable customers in the most efficient manner. Hold expertise in their area of work, our employees work in close coordination with each to avoid any hassles in the workplace. Our team consists of skilled and semi-skilled professionals, who are trained at regular intervals of time to enhance and polish their skills in the most efficient manner. They follow various customer-centric approaches while interacting with our customers, to understand their needs in the most efficient manner. To process the offered fertilizers in accord with the industry set norms, we have set up a huge infrastructure at Anand - 388121, Gujarat. We carefully segregate our infrastructure into processing, warehousing, packaging, in-house quality testing and sales & marketing unit. Valued by our customers for its large-scale production capacity, our infrastructure is well-equipped with latest tools and equipment. By upgrading our infrastructure at regular intervals of time, we have been able to meet the diverse needs of the ever-changing market trends in the most efficient manner. We assure that the best quality of the offered fertilizers is never compromised. For this, we procure the raw materials from some of the most trusted vendors of the industry. Post processing offered range is tested on various quality assurance parameters such as effectiveness, purity and compositional accuracy. We have appointed a team of quality controllers after carefully assessing their skills, knowledge, and experience. In addition to this, we provide regular training to our quality controllers. Due to our high-tech processing facility and highly experienced professionals, we have been able to cater to the precise needs of our valuable customers. Customize packaging is offered, keeping the ease of our valuable customers. Client centric approach is also followed, in a zest to attain maximum customer satisfaction. We follow ethical business practices and provide our customers with easy payment mode, keeping the ease of our valuable customers in mind. Timely delivery of the offered range has helped us in winning the trust of our valuable customers. 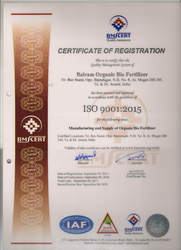 Balram Organic Bio Fertilizer is an ISO 9001:2015 certified company.